Hey y'all. My name is Helene and I'm here to take over while Jessica is doing God knows what. JK. Getting hitched!! Whoo hoo! You should know, I get excited. I blog over at Helene In Between and I enjoy piña coladas and long walk on the beach. But mostly, dancing. My favorite thing in life is to break it down. Anywhere. Anytime. No drinks needed. A great place to dance is at weddings. But sometimes it's hard to get the party started. People are nervous. They don't want to be the first on the floor. I get it. That's where people like me come in. People that have no regard for embarrassment and will just start bouncing. 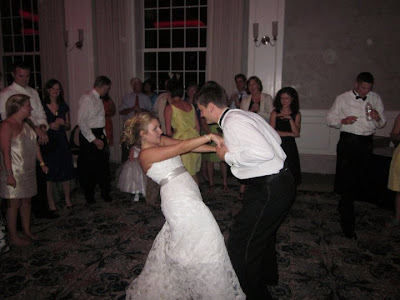 There was no shortage of dancing at my wedding. I even rapped a little Nicki Minaj. But then again, I also just got on a cruise ship and danced for a full minute and a half without a drop of alcohol. Liquid courage is sure to help you out if you are nervous about showing everyone your moves. Liquor makes people weird and when they get weird they like to dance. Period. Ok yes, it's annoying. But If you play the cha cha slide, the wobble, electric slide and that gosh darn Cupid Shuffle, you are sure to get the party moving. Everyone will get up and do these dances. Like it or not. If I never hear the Cupid Shuffle ever again, then it's too soon. But I know to get a party going, it works like a charm. No one can refuse dancing to "Shout" by the Isley Brothers. This song is a classic. Get a little softer now, the entire crowd- old and young is getting low and waiting for their chance to scream. 4. Put the lights down low. People feel more comfortable if no one can see your moves! Lower the lights or just keep it on mood lighting. 5. If All Else Fails- Dance By yourself. It will eventually get others out there with you. And you'll end up being the life of the party. What's better than that? Or they may stare in horror. Dancing solves everything. So act like no one cares and get you're booty out there! Thanks so much for having me Jess! And stop by blog sometime and say hi! There's plenty of dancing posts. yes. yes and yes. 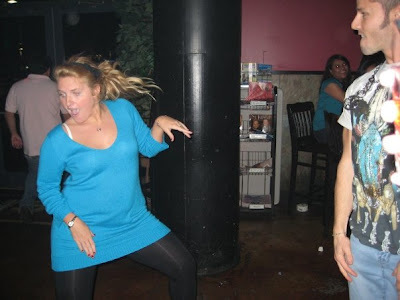 and if all else fails, check out helene's dance moves before for a little aint-no-shame courage! love. Wedding Planner: to hire, or to not?